Six years ago in our exhibition 'The Forties' many people were able for the first time to see drawings by Bet Low of the early period of her career. These underlined the shift in style that had developed in her work over the years. Yet, the difference is perhaps not so great as may at first have appeared. For, central to her work at all times is Bet Low's intention and ability to express not merely what she sees but, more importantly, what she feels. The subjects may have mellowed in some cases. But whether we are looking at her children and adults in bleak urban surroundings, or her families on a Clyde Coast caravan holiday, her ruminative abstracts of the sixties or the alternating drama and tranquility of her West Coast paintings of today, we find a quality which is common to them all. It is a clear sense of the strong subjective involvement of the artist herself. Much of that approach to painting derives from the central European influence of the Polish painters Josef Herman and Jankel Adler who worked in Glasgow at the beginning of the war. And from the spirited philosophise of the recently returned JD Fergusson who also lived in Glasgow at the time. Like many painters, Bet Low has kept her sketchbooks which accompanied the successive stages of changing responsibilities, freedoms and predicaments of ordinary family life which confront almost every serious woman artist. 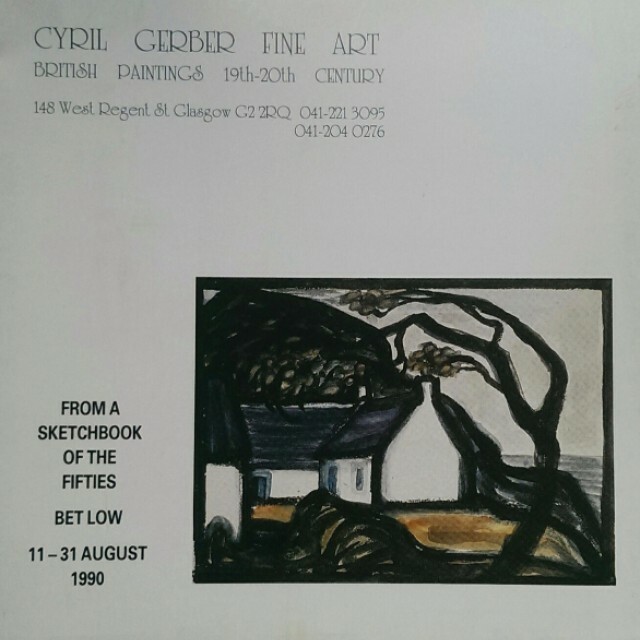 The present exhibition shows drawings and watercolours of the late forties and fifties - a period when most of her activities took place in central Glasgow, with brief spells with friends on the Clyde Coast or in Perthshire. Few have been shown before. Hopefully they will be helpful, especially to her more recent admirers, in filling in gaps in the interesting career of one of Scotland's most active and respected artists.